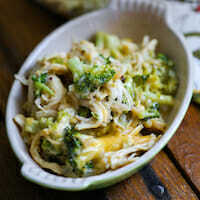 This creamy, satisfying one-dish Cheesy Broccoli Chicken Casserole is a guaranteed to be a hit at your dinner table! In a large saucepan, melt the butter over medium heat. When melted, add the onion and garlic and cook, stirring frequently, until fragrant and the onions are translucent. Add the flour and stir until it starts coming together with the butter and the onions. Slowly add the chicken broth, a little at a time, whisking after each addition until any lumps of flour are smooth. Cook, stirring frequently, until the mixture coats the back of a spoon. Add the salt and pepper and remove from heat. Add 1 cup of shredded cheddar and stir until smooth. Add the broccoli. While the sauce is cooking, spray a 9×13″ baking dish with non-stick cooking spray. Combine the chicken and rice in the dish. After you’ve added the broccoli to the sauce, add it to the rice/chicken mixture and stir to combine. Sprinkle with the shredded parmesan and the remaining 1/2 cup of cheddar cheese. Cover with aluminum foil and bake for 25 minutes or until casserole is hot and bubbly. Important Note: The original recipe called for 4 and it was way too much chicken for our tastes, but you can go up to 4 if you need to use it up or if you just really like chicken.